1. INTRODUCTION Here begins the strange story of an earthman whose powerful will carried him across 43 million miles of space! 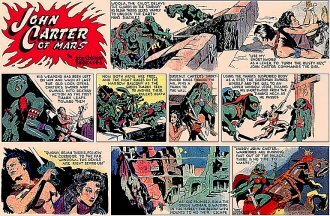 The following tale is compiled from John Carter’s memoirs written upon his return from Mars. 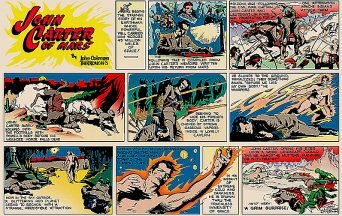 Arizona, 1865 – Following the Civil War, Captain John Carter and Lieutenant Jim Powell are prospecting for gold – one afternoon Apache indians attack them. John Carter barely escapes into the foothills with Powell’s body before his wounded horse falls dead. Seeking to hide his friend’s body, Carter is choked by strong gaseous vapors inside a lonely cavern. He slumps to the ground, paralyzed; then something snaps. “Before me lies my own body!” He whispers. Now in the sky outside, a glittering red planet seems to beckon with a strange, irresistible attraction. Hypnotized by its overpowering fascination, the man stretches his arms toward the flaming planet. In an instant of extreme cold and darkness he is drawn through the trackless immensity of space. At his first sight of the charging Martians, John Carter’s muscles react strangely to the lesser gravity. Tars Tarkas, the leader wishing to capture alive this jumping oddity, approaches in friendship. There is no alternative but to accompany the giant warriors. To a gathering throng of curious Martians, Tars Tarkas describes in glowing terms his captive’s great ability. Tars Tarkas indicates that Carter should leap once more. A brutal fellow, in crude jest, trips the earthman. Drogar ~ The Mighty, laughs boistrously at his superb joke. John Carter’s fist crashes on Drogar’s chin. “I am not amused!” the earthman snarls. 3. 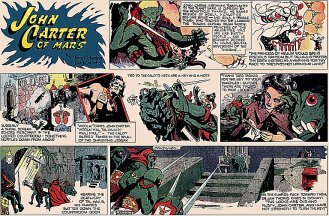 THE FAIR CAPTIVE John Carter strikes the Martian who attempts to bully him – the powerful blow kills Drogar. Tars Tarkas indicates that Carter has won the rank and possessions of Drogar. “Some Martian tailor will have a job here,” Carter laughs. “Sola is a patient teacher,” Carter replies modestly. One day an airship passes above the ancient city. Tars Tarkas shouts quick commands to his men. Crippled by a withering hail of deadly bullets, the ship spins down out of control. The Martian savages race out to finish the survivors and loot the wrecked craft. “You are like earth people!” Carter exclaims. Now Carter beholds a lovely girl struggling vainly against her giant captors. 4. DEJAH THORIS The green Martians bring precious loot from the wrecked plane and the Captive princess is dragged to the market-place for sentence. “What means this trespassing over our land?” Tars Tarkas demands, angrily. “Because we are a superior race,” yells a jealous high chieftain, kicking the girl viciously. As the brute’s hideous laugh rings out in the ancient streets of Thark, John Carter leaps forward in blinding rage at the cowardly act, his watchdog close at his heels. As he nears the mounted chieftain, the earthman draws his shortsword and crouches for the mighty leap. His steely fingers close over a huge tusk as blow after blow he drives into the enormous chest. “You live with green men, yet risk your life for a stranger. Killing a high chieftain means torture and death along with me. Who are you?” The girl’s soft eyes echo the question. 5. SENTENCE OF DOOM “Tal Hajus must sentence the earthman for his crime,” Tars Tarkas speaks. Sola watches – Sola who taught John Carter the Martian tongue. Beside her is Woola, his watchdog. Now they see the guards at the palace gates tie the earthman’s hands behind him. Suddenly a shrill scream echoes piercingly in the locked courtroom – something hurtles down from above. 7. CONTINUED “The Lock Opens” Woola, the calot, delays the guards on the stairway as Dejah Thoris seeks vainly to unlock the man’s shackles. 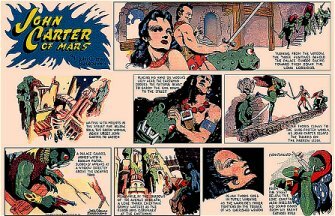 “Use my shortsword as a lever to turn the rusty key,” John Carter commands the girl. His weapons had been left on him and when at last the old lock opens, Carter’s sword arm swings into deathly action as the first Thark leaps toward them. Now both arms are free and the fight rages on the narrow balcony as the green Tharks seek to avenge their ruler’s death. Suddenly Carter’s short sword sings through the air, and pins a Thark to the wall. Using the Thark’s suspended body as a step, the Earthman swings himself and the girl to an upper window ledge, pulling his shortsword from the Thark’s neck as he passes. 8. CONTINUED “Radium Pistols and Cathode Rifles” Turning fromt he window the three fugitives behold the palace guards racing toward them down the long corridor. Waiting with mounts in the street far below, Sola, the green woman, again urges John Carter to hasten. Placing his hand on Woola’s ugly head, the Earthman orders the faithful beast to carry the girl down to the street. Dejah Thoris climbs to the sure-footed Woola, as John Carter delays the Tharks on the narrow ledge. A palace guard, armed with a radium pistol, suddenly appears at the window directly above the escaping trio. Meanwhile, in the shadows of the avenue beneath, a lone Thark chieftain grimly watches as the guard aims carefully at the Earthman. Dejah Thoris cries in futile warning as the warrior’s finger tightens on the trigger of his cherished weapon. From the street below, the lone chieftain also fires, but no sound issues from his silent cathode rifle. Sorrowfully, Sola waited for John Carter’s body to hurtle down when the guard’s pistol spoke. But oddly, it was the guard himself who lurched forward, a round hole through his chest. A strange feeling of friendship for the Earthman prompted Tars Tarkas to fire at one of his own race. With a shriek of pain, Tars Tarkas’ victim tumbled out of the window and plummeted toward the girl. Horrified, Dejah Thoris watched the body whirling toward her as Woola reached the end of the narrow ledge. John Carter, dispatching another foe, wheeled for an instant to witness the girl’s peril. The Earthman sprang toward Dejah Thoris, to fling her fromt he path of the falling Thark. He whisked the princess from Woola’s back, but the momentum hurled them off the ledge. They hurtled downward until the Earthman clutched a hold. Descending to the street, Carter and Dejah Thoris leaped upon the waiting thoat – and guided by the faithful Sola, they raced toward the desert, while Woola followed. As the howling warriors saddled their nervous, squealing thoats, the fugitives sped away fromt he ghostly ruins of the ancient city. Tars Tarkas again proved his friendship for Carter by dispatching pursuers in the opposite direction. All night the fugitives traveled and at dawn one of the tired thoats collapsed, unable to proceed farther. Through long, hot days they plodded on across endless miles of desert waste seeking some landmark familiar to the girl. Sola had brought few provisions, but each enjoyed heartily his scant ration at the evening meal. When the camp finally breathed deeply in slumber, something crept nearer out of the dense shadows of the night. Woola was away hunting, and no scent of approaching danger was wafted to the lone thoat grazing upwind. Now the creature emerged into the firelight and loomed above the sleeping girl like some hideous apparition. Her frightened cry was choked byt he rough hand that was clapped across her mouth! Then, across the moonlit sands of the dead sea bottom, a giant ape lumbered away with the struggling princess. At dawn, John Carter and Sola studied the tracks of Dejah Thoris’ abductor. For speed, John Carter rode alone to rescue the princess, ere she was carried into Go-La-Ra. With the face of Dejah Thoris ever in his mind, he tracked her abductor across miles of ancient sea-bottom. At last he came to Go-La-Ra, a great metropolis that had once stood on the banks of a sea long dead. Meanwhile, Dejah Thoris was carried ever deeper into the lonely depths of Go-La-Ra, city of the deadly mist. To Go-La-Ra, city of the deadly mist, John Carter tracked the Princess’ abductor. There he bade goodby to his frightened thoat, knowing the beast would return to Sola. Then as Sola had instructed, John Carter covered his body with yellow oil from a certain pit, lest when entering the city, he turn to stone. Strangely pungent became the vapours, as the Earthman ascended the cliff. Carter wondered if their terrible effect would be neutralized by the yellow oil. Meanwhile, Dejah Thoris was carried ever deeper into the dark city of death by her giant captor. John Carter tracked his prey relentlessly. Would he be in time to save her fromt he beast before her body turned to stone. The ancient city teemed with weird creatures who were, like the girl’s abductor, immune to the deadly mist. Suddenly Carter halted, grasping his sword tightly; then, he realized that against such as these, the mighty blade was useless. His skin anointed with yellow oil for protection against the petrifying vapors, John Carter tracked the girl’s abductor into the ghostly city of Ga-La-Ra, until suddenly – he saw before him a group of people, like himself, yet oddly different. None moved as he approached – and then he knew the truth: all were dead! The strange gases suddenly erupting from the ground ages ago, had turned these people to stone. Before a geyser of vapor, the Earthman found a piece of the princess’ garment. What chance had the girl here, with no yellow oil to protect her form these petrifying gases? Now through the misty vapors, Carter beheld the princess, Dejah Thoris, motionless in the arms of the giant ape. Even as he watched, the mist obscured them. Was he too late? Had her soft young body already changed to stone? Even as the Earthman watched, the vision of the girl and ape seemed to fade away in the misty vapors. Was this an apparition, or had they in truth been turned to stone by the strange mist? Then he realized that the ape at least was alive, and he raced around the geyser to intercept it. The earthman saw what he had feared – the girl’s skin was already turning gray! Across the plaza of petrified dead, Carter’s earthly muscles carried him in great, leaping strides as he gained on the brute. Realizing escape was impossible, Grombo placed his foot ont he girl and turned to meed Carter. “She is mine!” he growled fiercely. “Me kill!” With sword drawn, the Earthman advanced toward the giant brute. “Me kill!” it shrieked again. Carter did not reckon on Grombo’s uncanny speed. In a flash the ape’s club had smashed the sword form Carter’s grasp! Before the Earthman could dodge, Grombo’s hands had clutched him and swung him crazily overhead. Then the great beast flung its victim through the air. Dejah Thoris, seeing her chance, leaped to her feet. With a bellow rage, Grombo charged after his escaping prize. Carter landed unhurt upon the debris of a crumbled building. Here he looked down upon the race below. The Earthman saw a desperate chance to aid the girl. He toppled a huge stone. As it fell on one end of the petrified log, the ape was hurled into the vapor pit. Immune only to an average amount of gas, the brute was turned to stone by the concentrated vapor! 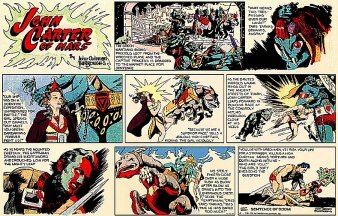 When John Carter reached the ground, Dejah Thoris had vanished; and although he called, only taunting echoes came from the street of standing dead. As John Carter looked through the vapors above, he saw the princess being carried away by a monstrous bird. The Durkoos had swooped down silently and clutched Dejah Thoris in its mighty talons. Now it flapped to the top of a tall building – to feed the girl to its young. Dejah Thoris tore herself away and ran to the parapet. Far below she saw the Earthman. “Stay in the sunlight, Dejah Thoris!” he shouted. “Sunlight will prevent the vapors from turning your body to stone!” Then John Carter dashed into the dark building – could he find a way to her side in time? Meanwhile, the mother durkoos began nudging the girl toward its nest of ugly, screeching young. Dejah Thoris smiled sadly. They would be grimly cheated – for her body, affected by the vapors below would soon change to stone. The mother durkoos soared off in quest of other prey, leaving Dejah Thoris in the nest as food for its young. Her skin was already ashen gray – soon would be stony hard. The deadly vapors below had done their work. Meanwhile, John Carter, making his way up through the building, found his path blocked by hissing dragons. His earthly muscles sent him in a long broad jump over the swaying heads. Then John Carter shattered the final door leading to the roof. Here he saw the young durkoos striving hungrily to reach the girl. The Earthman’s sword turned crimson as he mowed a path to his princess. As the sobbing girl threw herself into the Earthman’s arms, a giant dragon’s head emerged slowly from the doorway behind. The great bird hovered above, inspecting those who dared trespass on the sanctity of her nest. Then it swooped down in a mighty dive to attack first its life-long enemy – the hizzah. Carter saw that escape for Dejah Thoris and himself had been cut off through the doorway by the hizzah’s mate; but perhaps there was another way. He shouted terse orders to the girl, then grabbed one leg of the durkoos. But the hizzah suddenly wrapped itself around the bird and together they were all swept from the rooftop! The durkoos flew over the city, seeking to dislodge the dragon clinging to its neck. John Carter and Dejah Thoris held desperately to its leg, powerless to control their fate. Below, Sola, the faithful green woman, and Woola, the Earthman’s calot, viewed helplessly their friend’s plight. “There must be a way, Dejah Thoris!” Carter declared. Suddenly his own words suggested a daring plan. Drawing his longsword, he began slicing away the bird’s wing feathers. He thought of the deadly fall if his plan failed. But slowly they lost altitude. Finally the man and girl dropped safely to the ground and the fighting monsters rose again. The joy of their reunion was short-lived, for the princess’ body, affected by the vapors in the city had suddenly turned rigid and stony! 21. VICTIM OF THE DEADLY MIST! A week had passed since the strange vapors of Go-La-Ra turned the princess’ body to stone. Meanwhile, upon a television screen in a high tower on the plateau, their every move was being watched. The wizard of Eo saw John Carter kneel before the stricken girl. The wizard spoke into his mouthpiece, and Oman, the mechanical man, hastened to obey his master. So it came to pass that Vovo, the wizard of Eo, and Oman the mechanical man, rode forth to intercept the strangers. Silently the wizard surveyed the Earthman. Only Vovo’s big eyes moved, gleaming weirdly in the moonlight. Then he mumbled low commands into his mouthpiece and Oman helped him to the ground. John Carter pointed to the girl. “Strange gases in the city of Go-La-Ra changed her body to stone,” he explained. The wizard of Eo shouted into his microphone and the mechanical mount leaped into the air. John Carter insisted on accompanying the stricken princess. The parting had been sad for Sola and she was worried. But Vovo, the wizard, was jubilant; eagerly he explained to the Earthman his recent mastery over gravity. Woola watched his master disappear into the sky. He whined nervously; all was not well here – even the brute knew. No doubt that Vovo was a genius, Carter thought, but could the little wizard restore life to the girl’s stony body? Atop the plateau loomed a wild, dense jungle – but where was the kingdom of which Vovo had boasted? Over the dense jungle Vovo guided his degravitated, mechanical mount until at last they came to the city of Eo. Vovo cried: “With my brains alone guiding the hands of my mechanical men, I built my own city! “Vovo is great! Vovo is mighty!” in monotonous repetition Carter heard the words come from the mouth of Oman, the mechanical man. “I am tempted to keep her and forget the ransom,” Vovo exclaimed excitedly, “She is really suited for another of my greatest experiments!” Vovo’s eyes feasted on the beauty of the stricken girl – her face was like a frozen mask of ersatz stone! Meanwhile, in the shadow of an archway, Oman, the mechanical man, silently watched his master. He saw John Carter’s sword point nudge Vovo’s ribs. The little dwarf drew away in surprise and anger. “Your genius will be short-lived, Vovo, unless you revive this girl, and do it quickly!” Carter snapped. But Vovo shouted into his microphone and Oman came forth, leading other mechanical men to his master’s aid. The Earthman’s tones struck terror into Vovo’s heart. “Halt! Halt!” the wizard shrieked into his microphone. Oman and the other robots halted at their master’s order. “Vovo’s will is our will,” Oman chanted monotonously. “Now, wizard, if you wish to continue living,” Carter spoke sternly, “you will revive the Princess Dejah Thoris!” Then Carter prodded Vovo across the laboratory to the electronic decalcifying machine. “I cannot always guarantee success when changing calcified tissue back to living flesh,” Vovo grumbled. After the wizard pulled the switch, Carter waited breathlessly while streams of bombarding electrons pierced the girl’s body. Strange thoughts raced through Vovo’s twisted brain as he stood behind the Earthman. “Look!” He screamed suddenly. Princess Dejah Thoris, whose body had turned to stone, was at last revived by the wizard’s electronic decalcifier. 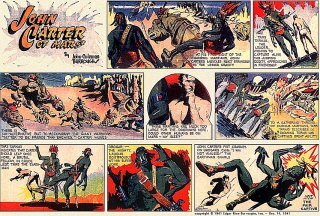 Now John Carter supported the weakened girl while he forced Vovo to lead them to safety. But outside the laboratory, a group of Vovo’s mechanical robots silently watched – and waited! The Earthman made Vovo mount the mechanical thoat --- then holding the princess, Carter leaped to the saddle behind the wizard. Down a lonely avenue in the grotesque city of Eo, the mechanical beast galloped away at Vovo’s order. “The princess desires to join her friends and then proceed to Helium,” Carter informed the wizard. But Carter’s words were hardly spoken when, at Vovo’s signal, their mount suddenly collapsed, hurling its riders to the street before a squad of mechanical men! “Seize them!” screamed the wizard as John Carter and the princess now fled on foot across the plaza. The Earthman spoke words of courage to the girl, urging her to greater speed. “He is right, John Carter.” Dejah Thoris cried in despair. “We grow tired – they never do!” Suddenly Carter grasped the girl and wheeled. His earthly muscles sent him in a high leap over the robot’s heads. Meanwhile, a great beast, approaching the plateau’s summit, heard faintly the noise of the chase. Then sounded the clanking of steel as Carter and Dejah Thoris were cornered at last by the tireless mechano-men. To Oman came orders to dispose of the Earthman and deliver the live princess to Vovo! Cornered by Vovo’s mechanical robots, John Carter fought desperately – seeking to forestall the inevitable. Suddenly a forked spear streaked through the air, pinning the Earthman’s sword arm to the wooden wall at his back. Carter sought to jerk away the spear, but a sword crashed upon his skull. Dejah Thoris screamed as he collapsed. The girl’s cry echoed above the clang of steel and came to the ears of the lone creature approaching the city. “Bring the girl,” Vovo now commanded, and a husky mechano-man seized the struggling princess. Now the crazed wizard led a wild race to the city’s outskirts where tonight he planned to wreak wicked vengeance upon the Princess of Helium, whose kingdom he fancied had dealt him great wrongs. The Mechano-men, led by Vovo, the wizard of Eo, carried Princess Dejah Thoris off into the night. Meanwhile, John Carter lay motionless where he fell after the sword had struck his head. Now something crept slowly toward him across the courtyard, moving silently on its eight padded feet. Then another form stepped out of the shadows. With sword in hand it looked down upon the Earthman. “No, John Carter,” Oman droned monotonously. “I hate Vovo, so I have returned to help you save your princess. Of all Vovo’s robots, my brain alone attained the power of independent thought. Only I can lead you to Dejah Thoris.” Then a savage cry rang out and Oman went down beneath powerful fangs and ripping talons. As the creature leaped upon Oman, John Carter recognized his old, faithful calot – Woola. Carter sprang toward the two combatants. He saw Oman work his feet beneath Woola’s belly. Suddenly, the robot extended his legs with great force. Woola was hurled backward. Then the Earthman made his final dive. He alighted astride Woola. Now his calm words of reassurance quieted the growling beast. “I must believe you now,” spoke Carter, “and trust you to lead me to Dejah Thoris ere Vovo harms her!” They hastened to the stables where Oman brought forth a robot mount. After Oman climbed astride, Carter leaped to the strange creature’s back. Then accompanied by Woola, the calot, they raced off upon the trail of Vovo, the wizard of Eo, and the Princess of Helium. Meanwhile, with the captive Princess, Vovo led his band of robots toward a mighty domed glass laboratory standing in a little valley upon the great plateau. Into the domed glass building Vovo’s mechanical robots carried the princess. The wizard had given the girl a strong drug and now she was oblivious to her impending fate. In the small glass building adjoining the larger laboratory, Vovo prepared for his greatest experiment. Now far above the laboratory, John Carter, Oman and Woola paused in their flight. Then Oman urged their robot mount down the rugged hillside, but Woola soon gained the lead. Sensing his master’s anxiety for the princess, Woola raced into the laboratory ere the great door was closed. Vovo cursed. Then he turned the lever that locked both girl and calot within the building. An instant later, amid the shatter of glass, the mechanical mount crashed headlong into the control room where the wizard sat. Suddenly the Earthman gasped in horror. “At last!” cried the wizard. “At last all Barsoom will hail my genius!” Vovo’s five hundred years of labor were now reaping grim harvest. Under the bombarding Z-ray, Dejah Thoris and Woola were growing rapidly in size. Under the wizard’s Z-ray machine, Dejah Thoris and Woola grew quickly to tremendous height. Like a tiny midget john Carter stood below them, seeking to attract their attention. “At that height their ears cannot hear our puny voices!” Vovo, the wizard screamed. Jumping about delightedly. At first, Dejah Thoris was unable to recognize the surroundings or her situation. Finally Woola perceived the tiny moving things at his feet. Angered by the silly actions of these infinitesimal creatures, Woola leaped out to punish them. All scattered except Vovo, who trembled in the beast’s path, unable to run in a sudden paralysis of fright. Vovo’s greatest experiment came to a tragic conclusion as Woola’s mighty paw crushed out the wizard’s life. 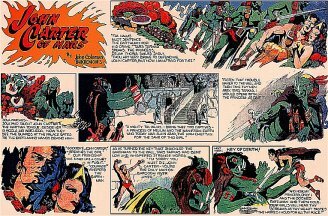 With a plan to attract the attention of Dejah Thoris, John Carter and Oman rallied the robot warriors. Still dazed by her sudden growth, the Princess of Helium staggered blindly through the city of Eo. Now the forces of Carter and Oman rammed the girl’s foot with a pointed stake. Feeling the tiny pressure, Dejah Thoris glanced down. But the building’s shadows were dark and obscured the men on the street. The Earthman sought another way to attract her attention. He climbed a tall building and then, gambling desperately with fate, he dropped toward the girl’s head. 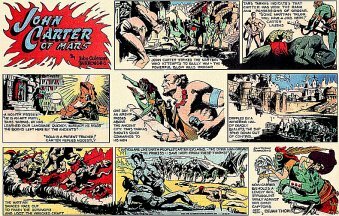 John Carter of Mars, Some ERB Images and Tarzan© are Copyright ERB, Inc.- All Rights Reserved.